An aging NASA spacecraft is gearing up for its last hurrah — a Valentine's Day rendezvous with a comet visited, and slammed, by another probe five years ago. The Stardust-NExT spacecraft is set for a close flyby of comet Tempel 1 at around 11:37 p.m. EST on Feb. 14 (0437 GMT on Feb. 15). The main goal is to see how much Tempel 1 has changed since July 2005, when NASA's Deep Impact probe flew by the icy wanderer and sent an impactor smashing into it, creating a crater. "Now, with going back, we'll be able to take a look at the surface and see what's changed," Pete Schultz, a Stardust-NExT scientist from Brown University, told reporters today (Jan. 19). The Stardust-NExT probe began its life as the Stardust spacecraft, which launched in February 1999. 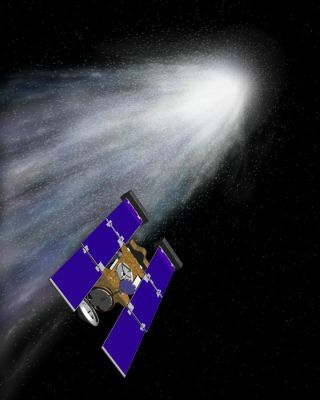 It accomplished its primary mission — to collect dust and gas from around comet Wild 2 and send the sample back to Earth in a return canister — back in 2006. Since the spacecraft was in good shape and had enough fuel, NASA gave it a new mission in 2007: to meet up with comet Tempel 1. With the new mission came an expanded name: Stardust-NExT (for “New Exploration of Tempel”). The 3.7-mile-wide (6 kilometers) comet completes an orbit of the sun every 5.5 years, so it has circled the sun once since Deep Impact's visit. Researchers hope Stardust-NExT will give them an idea of how Tempel 1 has changed during this time. "We're going to find out a lot about how comets evolve from perihelion passage to perihelion passage," said mission scientist Steve Chesley of NASA's Jet Propulsion Laboratory in Pasadena, Calif. “Perihelion passage” describes an orbiting object's closest approach to the sun. The Deep Impact probe couldn't get a good look at what its 816-pound (370 kilograms) impactor, traveling at 6.2 miles (10 kilometers) per second, did to the comet surface in 2005; the ejected dust and stirred-up debris obscured the views of the new crater. "We should be able to resolve the impact," Schultz said. "I really hope we get to see the impact crater, but that's going to be a bonus." Getting a good look at the crater could reveal a great deal about Tempel 1's makeup, according to Stardust-NExT principal investigator Joe Veverka of Cornell University. That knowledge could help plan out future missions to return samples from a comet's surface. Such missions could help researchers determine the likelihood that comets provided the raw materials for life on Earth and perhaps elsewhere in the universe, Veverka added. "It's a step toward the ultimate answer," Veverka said. Stardust-NExT has already logged about 3.7 billion miles (6 billion km) in space, researchers said, and it will put a few more on its odometer before calling it quits. The spacecraft is currently about 15 million miles (24.2 million km) from Tempel 1. It will close to about 124 miles (200 km) on the night of Feb. 14. The probe will take 72 high-resolution images and begin transmitting them to Earth an hour after the flyby, researchers said. It will take about 12 hours for all the pictures to reach researchers on the ground. When the flyby is done, the spacecraft's work will be, too. It won't have enough fuel left to do much else, researchers said. But Stardust-NExT should go out on a high note. "The spacecraft is working wonderfully well," Veverka said. "The science team is awfully excited and can't wait to see all the pictures."